What, if anything, does it mean for America’s democracy that our new leader is a floppy-haired man who wears baggy, Italian-made suits and holds his tie together with scotch tape? In this week’s episode of Big Time Dicks, Jezebel’s Ellie Shechet and Julianne Escobedo Shepherd interview Dominic Sebag-Montefiore, creative director and cutter at world-famous Savile Row tailor Edward Sexton, about America’s worst political fashion offenders and what message Trump is sending to Americans with his sartorial decisions. Sebag-Montefiore observes that Trump’s “ties are long” and “he often looks quite crumpled,” a statement that one could also probably apply to Trump’s mental state. “I just don’t get the impression that he puts that much time and effort into it,” he says. “Looking at his suits, I think he’s just very generic and safe and he doesn’t have to think about what’s going to go with them. It tends to be a navy suit with a white shirt and a red tie. And that is quite a political uniform,” he said, noting that Trump looks like the “generic businessman”—which of course is what Trump was for decades. Sebag-Montefiore observes that his hedge fund manager clients tend to dress more casually than their employees, signaling that they’ve already proven themselves and earned the right to wear whatever they want. 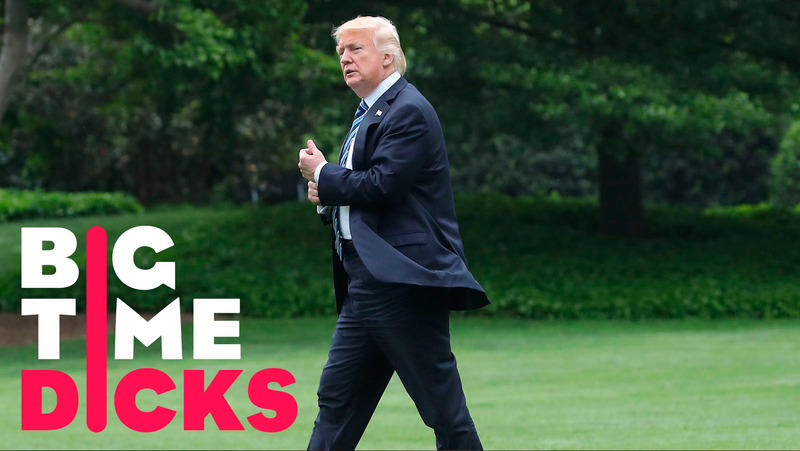 “Perhaps your president doesn’t feel like he needs to prove anything anymore because he’s done it all,” Sebag-Montefiore muses. Sebag-Montefiore also shares some other interesting observations about the circus-folk running through the White House, like noted racist Ted Nugent, who wore a black shirt and a ridiculous hat to the Oval Office. “Black shirts are associated with fascism in the UK,” he says. Interesting! Sebag-Montefiore also discusses microwave expert Kellyanne Conway’s bizarre inauguration ensemble and his thoughts on American fashion in general (we’re frumpier). At least when it comes to fashion, in Trump perhaps we have the president we deserve.